Objectives: The Poller Screw has been used to supplement intramedullary interlocking nailing in treatment of long bones fracture in order to keep the nail in the desired position and stabilize the fracture. Our aim was to study the mechanical effects of Poller screw (blocking screw) in addition to stability after fixation with interlocked intramedullary nails in the fracture of proximal and distal tibial shaft. Methods: We retrospectively analyzed clinical and radiological outcomes of 60 tibial fractures, 24 proximal third and 36 distal third who underwent treatment with Poller screws from July 2008 to June 2012. Mean follow up was 12 months. Results: In all fractures healing was obvious radiologically at a mean of 5.6 ± 2.3 months (3 to 12). Postoperatively 57 cases had <5° valgus or varus deformity; 3 cases had 8° valgus deformity. The only complication related to the procedure was one case of irritation of anterior tibial tendon. The clinical outcome, according to knee rating scale of the Hospital for Special Surgery, was excellent in 15% good in 40%, satisfactory in 35% and fair in 10% and was not influenced by previous or associated injuries. Conclusion: The use of poller (blocking) screws in combination with an intramedullary nail has been found an important additional option that can be used to improve and maintain reduction and fixation of long-bone fractures at the diaphysio-metaphyseal junction, where there is strong tendency for axial displacement. The Poller screw has been observed to work as nail stabilizer and thus enhances fracture stability. However, the retrospective study with small number of cases and without a control group has raised limitations on the outcome analysis. It is known fact that proximal and distal fractures of tibia tend to angulate into varus when treated with intramedullary nails or functional braces. Proximal fractures of tibia tend to angulate into anterior bowing when fixed with nail when fibula is intact. Intramedullary nailing for metaphyseal tibial fractures with short proximal and distal fragment is associated with frontal and sagittal plane malalignment. This may be attributed to an inaccurate entry site, displacing muscular forces and residual deformity along with discrepancy between voluminous area of the metaphyseal-diaphyseal junction and size of nail [2,3]. In the absence of metaphyseal cortex contact, the nail may translate along interlocking screws, owing to the play between screws and the nail holes. This can be limited by the use of blocking or poller screws [4-7]. The blocking screws are placed so as to effectively reduce the size of the medullary canal either proximally or distally and thereby guide both the guide wire and the nail into an acceptable position. They can be placed in any plane but are usually placed in either the sagittal or coronal planes [8-17]. We therefore evaluated the outcome of intramedullary nailing in combination with poller screws for proximal and distal tibia fractures. The poller screws have been used to guide the nail in the desired central position before inserting the interlocking screws. However, it has been observed that the poller screw functions like stabilizing device for the nail and fracture [16,17]. The main objective of this study is to present our experiences with the role of poller screw in combination with intramedullary nail in our set up. We studied retrospectively 60 fractures of tibial shaft in 60 patients between July 2008 and December 2014 (48 male and 12 female) with mean age of 34 ± 15years (19 to 49). All fractures were following road traffic accident. In 54 patients, fracture was the only injury and in 6 patients there were additional injuries which did not affect the treatment. The poller screws were placed in patients with displaced fractures of the 24 proximal and 36 distal third which were extraarticular. The mean length of the proximal and distal fragment was 92.50mm (SD, 3) and 60.75mm (SD, 4) respectively. The mean length of the fracture was 82.90 mm (SD, 5.8). We followed the AO classification for the fracture pattern (A, 15; B, 27; C, 18), the Tscherne classification  for soft-tissue injuries in closed fractures (n=48), and the Gustilo classification  for soft tissue injuries in open fractures (n=12). The metaphyseal fractures were stabilized with a locked tibial nail placed without reaming. Intraoperatively the knee was kept in semi extended position .The implants used were stainless steel tibial nails. The screws used for ‘blocking’ were locking screws of different sizes or 4.5 mm cortical screws or 6.5 mm cancellous screws. On the concave side of the deformity, poller or blocking screws were placed between the cortex and nail using image intensification. In all cases of instability and malalignment, the screw holes were drilled with nail in situ while applying manual over correction. The poller screws were placed first and later the nails were inserted in 6 cases where the previous track of removed nail caused malalignment of fracture. The operation was performed in less than 24 hours following injury in 45 cases and delayed in 15 cases. The screws are placed at concave side of deformity, proximal or distal to Fractures (Figure 1). Figure 1: (A,B,C) : Techniques of Poller Screw Insertion. Postoperatively, mobilization was allowed as and when pain free. The static and dynamic quadriceps exercises and partial weight-bearing (15 to 20 kg) were allowed for 6 to 8 weeks. Thereafter, weight-bearing was increased gradually depending on the absence of pain and radiographic evidence of bone union. Patients were evaluated using the Hospital for Special Surgery knee rating scale . Patients were followed up at intervals of 6 to 8 weeks for a year, and 6 monthly thereafter. Neurovascular condition, alignment, and functions of the affected limb were assessed. Alignment and deformity was calculated by drawing the anatomic axis of tibia in both proximal and distal fragments on radiographs. The amounts of varus/valgus and procurvatum/recurvatum were then calculated. Varus and procurvatum angulations were expressedas positive values, and valgus and recurvatum as negative values. Healing was defined as the ability to bear full weight without pain and support, with callus bridging in 3 of 4 cortices on radiographs. In all 60 cases, fractures united eventually. Healing was seen at a mean of 5.6 ± 2.3 months .All patients performed their daily activities of living and walked with full weight bearing and without limp or shortening. 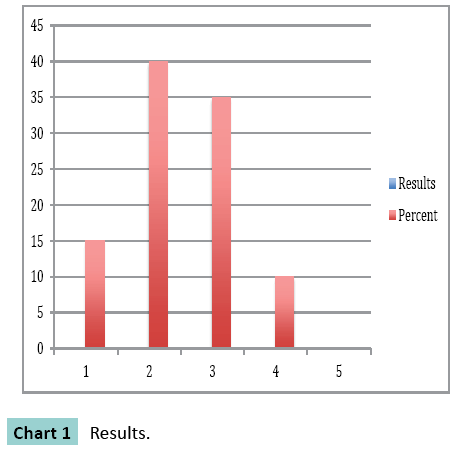 According to the knee surgery rating scale of the Hospital for Special Surgery, outcome was excellent in 15% good in 40%, satisfactory in 35% and fair in 10% and was not influenced by previous or associated injuries (Chart 1). Preoperatively in 24 cases of proximal fractures, 9 were in neutral position 9 had varus and 6 had valgus deformity. In case of distal fractures 15 were in neutral position and 21 had valgus deformity. The range of valgus to varus was + 25° to -11°. In total 15 cases had procurvatum and 21 cases had recurvatum deformity which ranged from +9° to -15°. 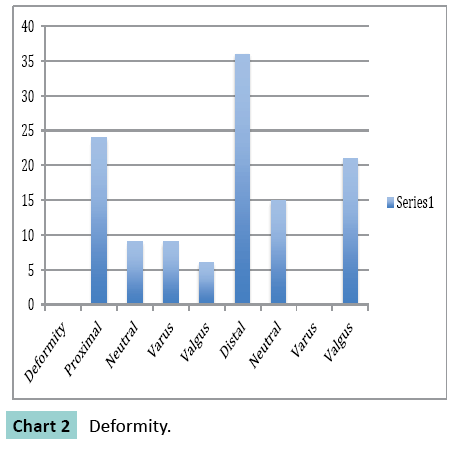 Postoperatively 57 cases had < 5 ° valgus or varus deformity 3 case had 8° valgus deformity (Chart 2). None of the nails or screws was broken. Total 24 patients underwent removal of the nails and screws. All patients had regained full quadriceps strength, with no ligamentous instability or flexion deformity. Postoperative complications included anterior knee joint pain (n=12), superficial infections (n=12), which were treated with local debridement and use of oral antibiotic and in 3 cases complication related to Poller screw was irritation of anterior tibial tendon in fracture of distal tibia (Figure 2). 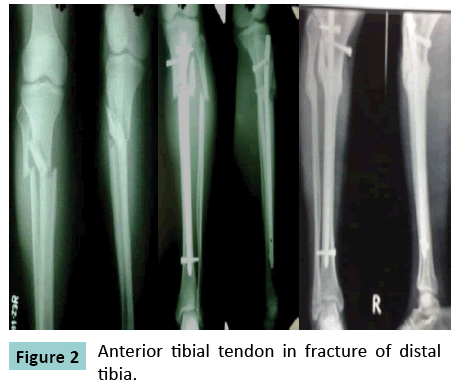 Figure 2: Anterior tibial tendon in fracture of distaltibia. In this case closed proximal tibial fracture, closed reduction and locked nail with poller screw placed that united with good callus at 5 months. (Figure 3). Figure 3: Closed proximal tibial fracture. In this case comminuted distal tibia that had tendency towards valgus displacement, reduction was maintained with an anteriorposterior blocking screw. The proximal and distal tibial fracture in the diaphysiometaphyseal region, stabilized with intramedullary nail is associated with a high incidence of malalignment [1,11]. This has been assigned to muscular forces which displace the fracture  and leads to instability. This results due to the play of a nail along the interlocking screws . The contributing factors take account of poor nail-bone contact in the metaphysis when screws are placed in the nails in one plane. The varus-valgus malalignment might follow after screws are generally placed in the coronal plane. Deformities in the sagittal plane are better accepted and are less common if the fracture is reduced at the time of initial locking. The poller screws, positioned nearby to the nail and at right angles to the screw holes, usually in an antero-posterior direction, have been suggested as one of the possible technique for improving the stability of metaphyseal fractures [6,7] and have been described as a tool for reduction used to overcome the displacing forces at the time of insertion of the intramedullary nail . The screws functionally decrease the width of the metaphyseal medullary cavity and are particularly useful with small diameter nails. Also its role is to correct imbalanced soft tissue that causes axial displacement. In 1999, Krettek et al. introduced the idea of placing blocking screws around nail (so called poller screws) [8,13]. Later, Biewener et al. used the sequential placement of kirchner wires to place an intramedullary nail with a good central position into a distal short fragment .This procedure was known as “palisade method.”The same technique described here for the tibia has been used also for the femur . All fracture in our series treated by intramedullary nail in combination with Poller screws healed with < 5° of valgus or varus deformity. This result appears to be superior to other reports for stabilization of diaphysio-metaphyseal fractures with intramedullary nails. Total 386 fractures of the tibia were analyzed by Ahlers and von Issendorf  and 59% of varus valgus malalignment greater than or equal to 2° were noted in 32 fractures of the Proximal third and in 47% showed this deformity in 138 fractures of the distal third. In both proximal and distal groups, alignment of less than 3° were observed in less than one third fractures and one-fourth to one-third had varus-valgus deformities greater than 4° (Chart 2). Anatomical alignment was observed in 40% of fractures of the shaft, but only in 31% of the proximal third and 30% of the distal third fractures. Similar results were reported in other studies as well [13,16,17]. The use of blocking (poller) screws in combination with an intramedullary nail is an important additional option that can be used to improve reduction and fixation of long-bone fractures at the metaphysio-diaphyseal junction, where there is a strong tendency for axial displacement. The blocking screw reduces the metaphyseal medullary cavity and helps nail to place it in the center, while the interlocking screws through the nail control length and rotation. The screw does not block anything. Instead, it provides a point of support on the side of the nail for the short fragment in an intramedullary threepoint construct. Therefore, it would be best to call these screws transmedullary support screws . The limitation of this study is its small sample size, retrospective nature and without a control group. Nevertheless the use of blocking (poller) screws in combination with an intramedullary nail is an important additional option that can be used to improve and maintain reduction and fixation of long-bone fractures at the metaphysio-diaphyseal junction, where there is a strong tendency for axial displacement. The poller screw has been observed to work as nail stabilizer and fracture fixation device which enhances the fracture stability. Freedman EL, Johnson EE (1995) Radiographic analysis of tibial fracture malalignment following intramedullary nailing. ClinOrthopRelat Res315:25–33. Ahlers J, von Issendorff WD (1992) Incidence and causes of malalignment following tibial intramedullary nailing [in German] Unfallchirurgie18:31–36. Krettek C, Schandelmaier P, Tscherne H (1995)Nonreamedinterlockingnailing of closed tibial fractures with severe soft tissue injury. ClinOrthop315:34-47. Krettek C, Schandelmaier P, Rudolf J, Tscherne H(1994) Current status of surgical technique for unreamed nailing of tibial shaft fractures with the UTN (unreamed tibia nail) [in German]. Unfallchirurg97:575–599. Krettek C, Schulte-Eistrup S, Schandelmaier P, Rudolf J, Tscherne H (1994) Osteosynthesis of femur shaft fractures with theunreamed AO-femur nail. Surgical technique and initial clinical results standard lock fixation [in German]. Unfallchirurg97:549–567. Krettek C, Schandelmaier P, Tscherne H (1995)Nonreamed interlocking nailing of closed tibial fractures with severe soft tissue injuryClinOrthopRelat Res315:34–47. 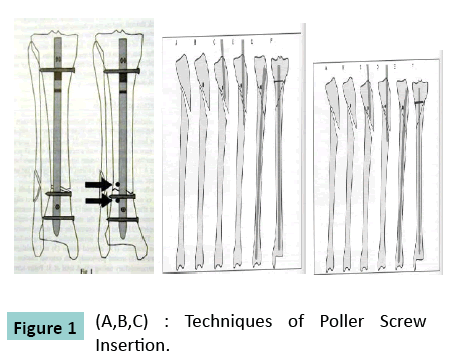 Krettek C, Rudolf J, Schandelmaier P, Guy P, Konemann B, Tscherne H (1996)Unreamed intramedullary nailing of femoral shaft fractures: operative technique and early clinical experience with the standard locking option. Injury27:233–254. Tscherne H, Oestern HJ (1982)Die Klassifixzierung des Weichteilschadensbeioffenen und geschlossenenFrakturen (Classification of soft tissue injuries in open and closed fractures). Unfallheilkde85:111-115. Gustilo RB, Mendoza RM, Williams DN (1984)Problems in the management of type III (severe) open fractures: a new classification of type III open fractures. J Trauma24:742-746. Tornetta P 3rd, Collins E (1996) Semiextended position for intramedullary nailing of the proximal tibia. ClinOrthopRelat Res328:185–189. Insall JN (1984) Surgery of the knee. New York: Churchill Livingstone. Krettek C, Stephan C, Schandelmaier P, Richter M, Pape HC et al. (1999) The use of Poller screws as blocking screws in stabilising tibial fractures treated with small diameter intramedullary nails. J Bone Joint Surg Br.81:963-968. Stedtfeld HW(2000) Die transmedulläreStützschraube–einesinnvolleErgänzung der Verriegelungbei der Marknagelung. [The transmedullary support screw—a beneficial additive to IM locking nailing]. OsteoInt (Suppl. 1)8:170-172. Biewener A, Grass R, Holch M, Zwipp H (2002) [Intramedullary nail placement with percutaneous Kirschner wires. Illustration of method and clinical examples].Unfallchirurg105:65-70. Kulkarni SG, Varshneya A, Kulkarni S, Kulkarni G, Kulkarni GM et al. (2012) Intramedullary nailing supplemented with poller screws for proximal tibial fractures.Journal of orthopaedicsurgery3: 307-311. Stedtfeld HW, Mittlmeier T, LandgrafP,Ewert A (2004) The logic and clinical applications of blocking screws.The Journal of bone and joint surgery Am 86: 17-25.